August had a great start on the part of Whale Sharks. The second and third week we had quite few sightings of Whale sharks. This was all nearby, just 25 minutes from Lux at dive sites “Back reef” and “Didhoo long reef”. Then, the last week of August was pure whale shark madness! 2 to 3 of them playing with the divers and staying with the group for 20 to 30 minutes, unbelievable! We have never seen this behavior with them for the last year. The best of it… all our divers had the pleasure to meet the whale sharks while diving for at least 1, or some of them, several times! 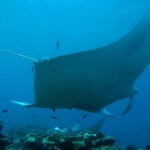 That’s what makes diving at South Ari Atoll a truly unforgettable life time experience. We have been busy as well with beginner courses such as Scuba Diver and Open Water diver and guess what… they also had whale sharks on their very first dive ! We look forward to welcoming you for some exciting dives, a true paradise waiting for all of you, see you soon in LUX* Maldives.